Featured! RDBoyer Home | About Us | Opportunities | Sponsorships | Contact Us! This week on Handmade Men we’re thrilled to be chatting with Robert Boyer who creates some amazing functional pottery and operates a much loved shop on Etsy. 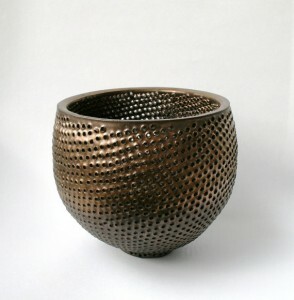 From highly textured usable vessels and bowls to truly unique sculpture pieces, Robert’s work captivates the eyes and intrigues the artist within. 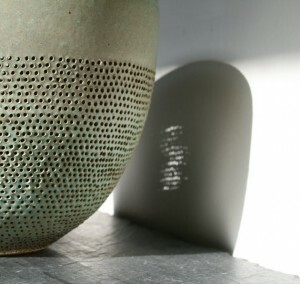 My recent work in clay is mostly about playing with texture and structure within a single form. If I pierce thousands of needle holes, or maybe just punch a few really big ones, into what was once a standard vase, I end up with a completely different object. A few of these holes or divots are just embellishment; sometimes a lot of them create an entirely new form. The accumulation of these simple actions into regular patterns can also create structures that mimic nature, honey comb, pine cones, etc. I find this process fascinating. The Etsy shop itself is a new challenge for me. It’s fun and interesting to mess around with the sculptural forms and ideas about structure but at some point they need to go somewhere. I took a bit of time to focus on the “getting it out there” part of the artistic process. I’m now excited to have a place to show the work. 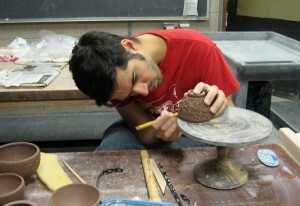 What got you started in working with clay? Growing up I was introduced to a lot of different art like drawing, painting, needlecraft, and pottery from different members of my family and in school. It wasn’t actually until I began working on a graduate degree in the sciences that I started focusing a bit more on ceramics. I found that for me many of those other artistic mediums required the same sort of analytic, focused attention that I was burning up all day with class work and research. Working with clay can be very tactile, and in grad school I made a lot of random shapes where my fingers were doing most of the thinking because my head was done for the day. Your work is really detail-oriented and textured. 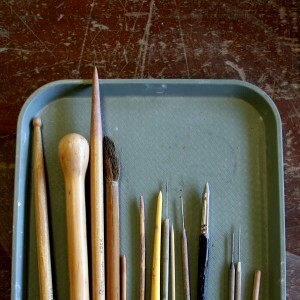 What kinds of tools do you use most in your work? As I’ve found some distance from grad school, my ceramic art has become much more detail-oriented. I spend most of my time in the studio punching divots or pierced holes into patterns that are often derived from my grad research. The tools for these techniques can be generally described as “pointy sticks.” Potter’s wheels and hand building techniques are fun, but from my perspective, the best part of what I do is the individually pierced holes or other repetitive detail work. 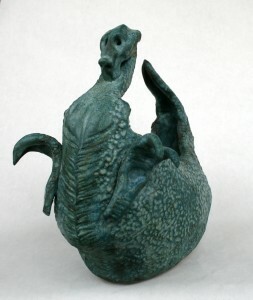 This dragon was built from simple coils of clay laid into place and then smoothed together. I sculpted the head and claws separately and attached them after pressing the scale texture into the surface of the body. 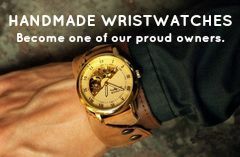 Why do you think that handmade is such a great option for men? I’m personally a huge fan of handmade items and have an almost dysfunctional drive to make the things I use on my own. (My friends make fun of me for this.) However, we can’t all be experts on every craft and every material. Supporting one another in handmade endeavors is a great way to have the best of both worlds, high-quality from an expert maker without having to solve every problem yourself. Being able to find this type of work in a masculine aesthetic is sometimes difficult which is why the Handmade Men site and the general promotion of men in craft is such a great idea. Thanks again for sharing your work and energy with us! Where can people find you online? 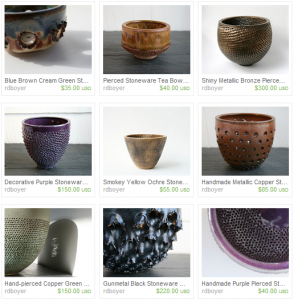 Tagged Ceramic, Clay, etsy, Functional Art, RDBoyer. Bookmark the permalink.